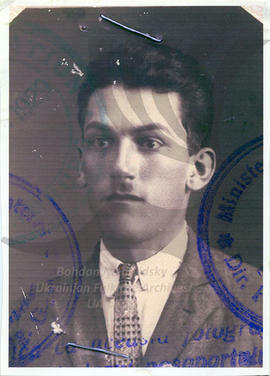 Nicolai (Nick) Gaudun was born on the 4th of May 1905 in Stanivtsi Horishni (Verkhni Stanivtsi), Kitsman’ raion, Chernivtsi region Bukovyna. His mother’s name was Vasylyna Tsurkan, father’s name was Aftanasii Gaudun. Nick had two uncles from his father's side: Nykyfor and Maftei. Nick’s father died at the age of 70, and the mother was left with 8 children. The oldest brother John took responsibility for supporting the family. 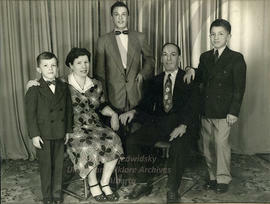 John went to the USA to Boston area in 1912 (when the father was still alive). Then the other brother Peter went to the Sates in 1913 to join his brother John. Nick's sister Elena went to Brazil same year. 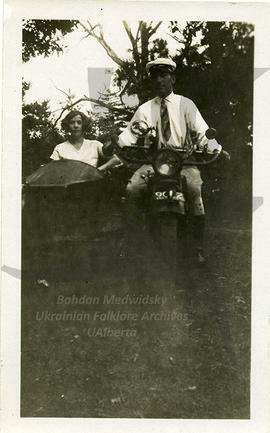 Nick had younger twin brother and a sister, and the youngest sister Frozina who was born in 1910. Brother Peter promised to take Nick with him to the States, but the World War I started and the connection between them terminated for a while. Because of the war Nick could not go to school, he finished only 2 grades. Only when serving 2 years in Romanian army, Nick went to school and got a telephone operator diploma. He also served as a baker in the army. 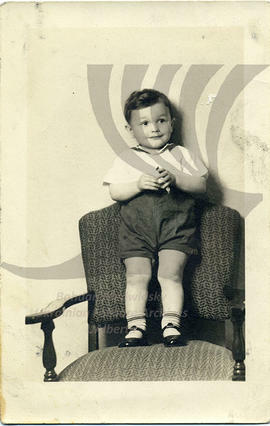 Nick immigrated to Canada at the age of 24, in 1929. He arrived to Montreal to his brother John, who at the time worked in the Queen Hotel. In Montreal he lived from 1929 until 1933. Nick worked in a baker shop owned by a Russian Jew. He also did road work for $25 per week, which helped him pay off his debt for the trip to Canada. Stephane (Stalla) Gaudun (nee Hretciuk) was about 6-7 years old when the World War I started. She went to school only for one month and the war broke up. Stalla did not receive professional education. Her parents finished 8 grades, and they were homeschooling their children. After the war, the schools were taught in Romanian language and the parents did not know Romanian to help out their children. Stalla lost her father at the age of 13, and three children were left with the mother. 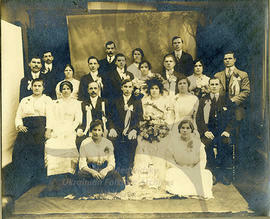 Later Stalla’s mother re-married a well-to-do man and went to live to another village. 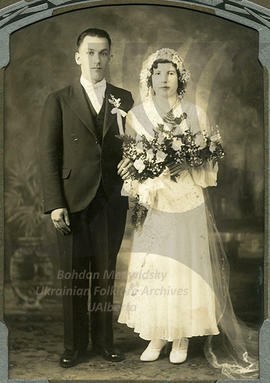 Stalla's older sister Raifta went to Canada and married John Lacosta. Stalla’s brother Petro avoided service in Romanian army for 2 years, but finally he got conscripted and received brutal treatment in the army. Because Stalla's brother Petro did not want to immigrate, Stalla's mother insisted that Stalla goes to her sister Raifta to Canada. 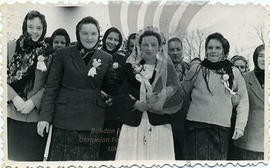 Stalla came to Canada in 1929 during Depression times. 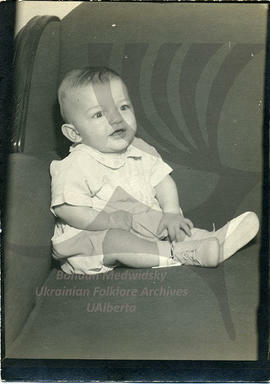 Shortly after arriving to Canada, Stalla worked cleaning houses, then she took care of two children during 6 months in a Russian Jew family in Kirkland Lake, ON. After that she worked in the rooming house 17-18 hours per day, where she had her room and board. 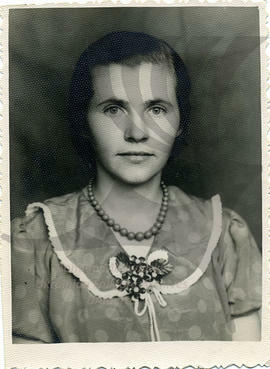 While working there she married Nick Gaudun and moved to Montreal on the 26th of March 1932(?). Stalla also worked in meat packing for 21 cent per hour(?) where she learned meat work. Nick got connected with Stalla throuh John and Raifta Lacosta when Stalla still was in Bukovyna. Aside from the fact that Raifta Lacosta was Stalla's older sister, Nick’s mother and John Lakosta’s mother were close friends. 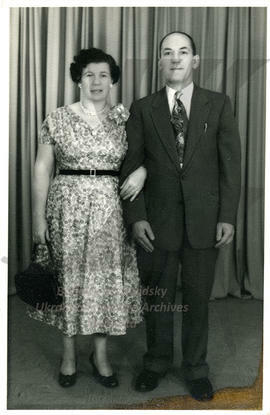 When Nick and Stalla got married they lived in Montreal. Later Stalla and Nick moved to Ansonville, ON, and opened their family business – Imperial Bakery, which they operated until 1946 or 1947, at which time they sold. They moved to St. Catharines where they had a grocery store for a short period (about a year). Later they had a butcher shop in Hamilton, ON, which was part of their Red and White Grocery store. Raifta and John Lakusta had a farm in Niagara on the Lake. Nick and Stalla had three sons: Steve, Peter, and Ted. All of them live with their families in Ontario. The collection consists of personal documents, immigration documents, photographs, audio and video recordings about a life of Nick and Stephani (nee Hretciuk) Gaudun and John Lakusta and his family. Stephen started videoing Stella and Nick in 1986 and finished videoing them in June 1995. The last video sequence in Iroquois Falls was done in 2003 and their gravestone the same year indicating they died in 1998 and 1999 respectively. The compilation of photos from the old family album was created in 2004.